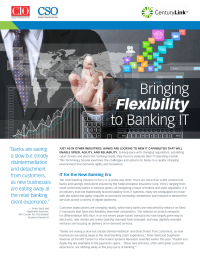 Just as in other industries, banks are looking to new capabilities that will enable speed, agility, and reliability. Enter hybrid IT, a fresh approach that enables banks to utilize on-premise, private cloud and public cloud assets in a flexible manner, customizing infrastructure and solutions to meet specific data, security and regulatory, scalability, and capacity needs. To keep pace with changing regulations, escalating cyber threats and electronic banking needs, they must re-evaluate their IT operating models. This Technology Dossier examines the challenges and options for banks in a rapidly changing environment that demands agility and innovation.